Why was Mukhtar Abbas Naqvi so angry over Sabir Ali's induction in BJP! After former Janata Dal (U) leader Sabir Ali joined BJP, there was a near-hysteric reaction from Mukhtar Abbas Naqvi. Naqvi, who is the vice-president of the BJP, tweeted about Sabir Ali's 'terrorist' connection. He inferred that if things continue this way, then Dawood [Ibrahim] may also be allowed to join the party. It was surprising as Naqvi, 56, has rarely reacted with such intensity before. With his reaction, he publicly embarrassed the party too. So what was the reason? Was it a feeling of insecurity that prompted him to target the party leadership for induction of Sabir Ali. 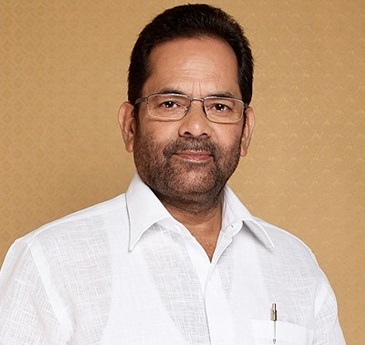 Naqvi is the most prominent face of the Bharatiya Janta Party (BJP). The party has had tremendous difficulty finding 'Muslim faces' in the past. That he belonged to UP, once the most polarised state during the Ram Mandir movement, was an advantage to him and the BJP too gave him enough importance. When no Muslim leader worth his salt associated himself with it, Naqvi was a proud BJP worker. Muslims openly expressed their dislike for the man who was in BJP when its leaders [Kalyan Singh, Vinay Katiyar, Uma Bharti] were more harsh on minorities and less 'polished' than today's BJP. Once he managed to win from Rampur Loksabha constituency too. The second Muslim face, Shahnawaz Khan, who has represented Kishanganj (Bihar) in the Lok Sabha, is much junior. It is only a few years back that Najma Heptullah joined the party. More Muslim leaders began joining the BJP. MJ Akbar is the latest entrant. For long, Mukhtar Abbas Naqvi enjoyed a unique position in the party. He was regarded and rewarded by the party. Even for the RSS, the dhoti-clad, Mukhtar, who often sported tilak on forehead, was quite close to the ideal Muslim as per their definition. But now, with the purported Narendra Modi wave, and when there is a feeling that BJP may emerge as the largest party and form the government, everyone is flocking towards the party. Sabir Ali may not be a big leader but he is quite articulate, even speaks English and has a 'rustic charm', as certain BJP leaders said. Also, Ali at least has some support among a section of Muslims in Bihar. Clearly, Naqvi must have felt insecure. For decades, he worked hard, faced all sort of criticism and condemnation, even abuses from members of the community, and when the party appears close to forming the government at the Centre, all these guys who have made no sacrifices, are joining the party & stealing the limelight! They may also become contenders in the hierarchy, as senior office-bearers or even ministers. Isn't it unjust? A friend remarked, 'Mehnat kare Murgi, Anda Khaye faqir'. No wonder, Mukhtar was so much upset that he shot off the tweet. We do understand your pain, Mukhtar Bhai. We really do. Aap logo.n ka kya khyaal hai? See the front page of the Urdu newspaper on the left. The masthead is quite colourful. It reflects the mood of the day. Holi is the festival of colours, and the top part of the paper, is tastefully designed, with the message, 'Holi Mubarak'. The Sunday edition too has multiple photographs, with reports about traditions of Holi in different regions. Apart from photographs, there are articles too on Holi, in other Urdu newspapers. An overwhelming majority of readers of these Urdu newspapers are Muslims. This is true for most papers, except, those in Punjab, Delhi and J&K. Many national English newspapers don't bother to wish readers on Eid-ul-Fitr of Eid-uz-Zuha, despite the fact that they have substantial Muslim readers. In the case of vernacular papers too, you find it quite common. In states, where due to hawkers' pressures, papers are shut on Id, they do mention about 'chhutti', that the paper won't be printed on the day. However, these things matter a lot. We have a shared culture and it is our tradition to be inclusive. That's what Indian-ness is all about. Isn't it. Now three links on the Holi day for you. Spare a few minutes. I am sure, most of you would be astonished. Around 300 policemen stormed into Rashid Compound in Mumbra (near Mumbai), entering houses, detaining elderly citizens, youths and even the minors. They were all brought out, forcibly taken towards the police vans and herded to the police station. Additional Commissioner of Police (ACP) Amit Kale led this operation that has sent shock waves in the entire Mumbra settlement, and causing anger among Muslims. There are 11 buildings in the Rashid Compound. All of them were targeted for this 'midnight search operation'. It was not about policemen entering one or two houses to catch suspects, with warrant. People were woken up in the midst of the night, without telling reason to women folk, the police dragged the male members away. The senior citizens, schoolboys and prominent persons including poet Obaid Azam Azmi were also forcibly taken away, for no fault of theirs. The victims have recounted the harassment faced at the hands of policemen, to newspapers. Inquilab reports that women in the bedrooms were woken up during this 'house search' operation. Azmi told the policemen that his father was an MLA, yet, there wasn't any respite. Local residents alleged that many policemen were drunk. 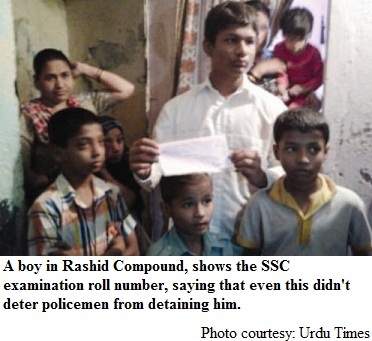 The incident stunned the residents and the news of the mass detentions spread like wildfire. People began gathering outside the police station. Local NCP MLA Jitendra Avhad and members of the social organisations began gathering on the spot. Seeing the situation was now getting out of hand, the police later released 80 persons. Residents said that it was saddening to see the mistreatment of such magnitude and the manner in which people were taken away like criminals and made to sit on the floor in police station, an eyewitness was quoted in the newspaper. This incident had occurred on the night of Wednesday and Thursday. The reports in newspapers quote residents as saying that policemen were armed with cutters to break the doors. Over a dozen police vehicles had entered the locality in this swoop. The reason was that police had to catch certain chain-snatcher. This report tells how '80 Muslims were held to catch a chain snatcher'. There was no criminal found among those detained. The police highhandedness has been widely condemned. On Thursday, meetings were held at different places. A formal complaint was also made to home minister. This has happened in a Congress-ruled state. Though an inquiry has been promised, the highhandedness and the totally unjustifiable action, once again shows the mindset and the biases of sections among the Maharashtra police. Report in Urdu Times, says that while officials in the raid had said that they had orders from top, senior officials said that they hadn't given any such order to conduct the midnight swoop. Mumbra is located in Thane district, but falls under Greater Mumbai. It has a population of nearly 10 lakh [1 million now]. The place has a strong Muslim population. In fact, minorities account for 70% of the population here. Jitendra Avhad is the NCP legislator from here. The police commissioner has also promised that inquiry would be completed in eight days, say newspaper reports. One hopes that the police officials will conduct an impartial inquiry and take action against policemen responsible for such excesses. Shamelessly, it was termed a routine checking drive! Where on earth, cops enter homes at 2 am, herd people out, parade them, force them into van, take to police station, made them sit on floor and then for no fault of theirs, and then say it is 'routine checking drive'. The officer Amit Kale hasn't been suspended as yet. There has been no action so far against other policemen who were part of the team. The officials claim that an inquiry has been instituted. Let's see if it is just a delaying tactic or they will take action. 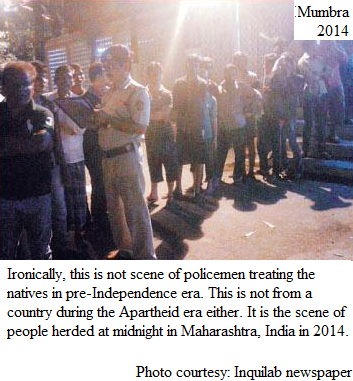 The English and Hindi newspaper almost completely ignored the incident, despite the gravity of the biased action. There is clear bias against Mumbra at the root of this post-midnight swoop. Indian Express followed the news and printed it on its front page. But for most other papers, it was just no news. TV channels that get into hyper active mode at minor incidents, didn't take up the case. It was an incident over which the Maharashtra government and Mumbai police ought to be questioned, so that corrective measures are taken. With elections round the corner, newspapers have again focused on factors like caste, community and religion, which do affect the choice of candidates as well as voting in polls in India. Dainik Bhaskar, a leading Hindi newspaper, has come out with an interesting report on page 1. The report tells us about how certain seats are perceived as 'Muslim seats', 'Sikh seats' or Upper Caste Hindu seats. Most of these are constituencies that have large percent of voters of the group. We all know that the religious or caste affiliation of the voter and the contestants do matter to some extent. Sometimes the constituency may not have the particular group as majority or a block. Yet, it is seen as the constituency where candidate belonging to that group is given ticket and wins easily. Interestingly, while focus is often on Muslim votes, because of a myth that Muslims vote 'en bloc'. In election season, such reports come too often. Journalists seem to enjoy filing such reports and discussing them. But this report interestingly talks of Savarnas vote [Upper caste Hindu population] too. It says that though the Upper Caste aren't a numerical majority in most seats, still, they command wide influence and around 125 constituencies regularly send Upper Caste contestants to the Parliament. 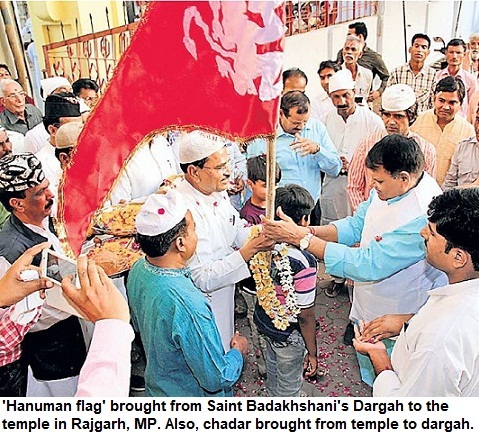 The report says that Lucknow may have a large Muslim population and also strong Shia populace, but most of the parties always fielded Upper Caste candidates from here. Either Shivrajwati Nehru, Hemwanti Nandan Bahuguna or Sheela Kaul who won thrice and later, former Prime Minister Atal Bihari Vajpayee who won five times from here. It also lists Indore as an 'Upper Caste' seat from where 'savarnas' have been winning for 45 years. Then, there is Allahabad constituency, that elected Pt Jawaharlal Nehru, Lal Bahadur Shastri, Murli Manohar Joshi, Amitabh Bachchan, VP Singh and Revti Rama Singh, all upper caste Hindus. It lists 36 seats in Andhra Pradesh, Karnataka, Kerala and Tamil Nadu, where only Upper Caste candidates win. While Punjab has 32% Dalits, more than half of the seats in the state are cornered by the Upper Castes. The 'Upper caste' seats often have a strong Muslim population too but no party risks fielding Muslim here. There are 172 constituencies that have Muslim, Sikh and Christian influence. But in the 125 upper caste seats, the factor of religion doesn't work, it says. There are 79 constituencies reserved for Scheduled Castes (SC) and 42 for Scheduled Tribes (ST) out of 543* (545) seats in the Lok Sabha. Of course, Dalits (SCs) and Tribals (STs) can contest from un-reserved seats too. 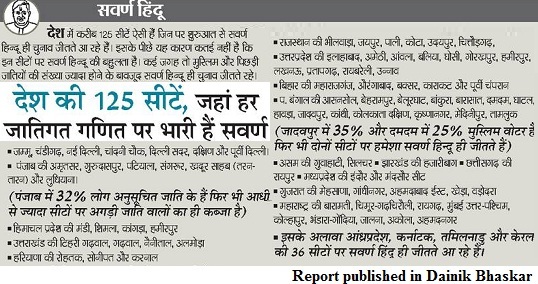 So out of the remaining 432 seats, Bhaskar has identified seats that have a trend of winnability among a particular religion or a group. Many places have huge backward (OBC) population too but there isn't focus on their voting and election pattern. The report says that 92 constituencies have Muslim influence. There are many constituencies in Kashmir, Kerala, UP and West Bengal that have 65-95% Muslims. 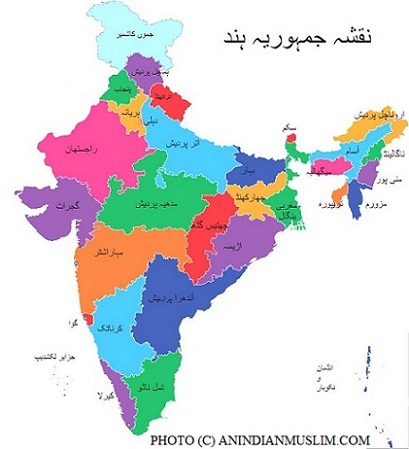 Then, there are constituencies like Laccadives, Kishanganj (Bihar), Hyderabad (Andhra Pradesh) too. The example is Assam's Dhubri where Muslim candidates win. AUDF's Badruddin Ajmal contested and won from here, defeating the Congress. Over all, seats that have more than 20% Muslims are included in list where the minority swing can make or mar candidates' chances. An interesting example is Araria seat in Bihar. Now, Araria has 41% Muslim population. Yet, seven Muslims were in the fray, and hence BJP's Pradeep Kumar Singh, won Loktantrik Janshakti Party's Zakir Husain by a margin of 2,000 votes. Of these 92 seats, most of them are in Uttar Pradesh, Bihar, Assam, West Bengal and Kerala, apart from J&K. There are 16 seats that have Christian influence. An example is Ernakulum in Kerala that has 38.8% Christian vote or South Goa. Then, there are many constituencies in North East and some other places in central and eastern India where Christian vote is decisive. The Christian candidates win from Nagaland, Mizoram and Manipur. Also, there are pockets in certain regions of South Indian states like Tamil Nadu and Karnataka. In a few constituencies in Jharkhand, Orissa and Chhattisgarh, too they have limited impact. Also, there are 16 seats where Sikhs are an important factor and decide outcome of the election results, like Bathinda that has over 75% Sikh voter. Sikhs are mostly concentrated in Punjab-Haryana region in North India. The other seats include Amritsar 77%, Sangrur 74%, Jalandhar 38%, Ludhiana 58%, Anandpur Sahib 57%, Fatehgarh Sahib 58%, Firozpur 51%, Patiala 55%, Gurdaspur 44%, Hoshiarpur 39%. Also, there are constituencies liek Chandigarh, Sirsa (Haryana) and Sri Ganga Nagar (Rajasthan). Now, that you have seen these trends and statistics, there is a message for you. You don't need to blindly believe every 'fact'. Anything can happen in election. It is not purely religious or regional line on which a person votes always. With polls barely two months from now, you will see analyses and more reports. See more on elections 2014 in upcoming posts.